Varenna Allen is both a very patient lady and a follower of dreams. Many owners have their fair share of ups and downs but it is rare to find one still so passionate about her horses when so many of them have been so simply disappointing! It all started when Varenna’s daughter, Sophie, stopped eventing her advanced mare Marsh Light in order to get a job. Varenna thought she may try her hand at breeding and the first foal was sold to the USA. The second foal was Dazzling Light who was bred as a result of Jennie Loriston-Clarke disagreeing with Varenna’s original choice of stallion and offering her opinion that Catherston Dazzler was plenty good enough! Jane Holderness-Roddam ended up riding the mare and so began a long and happy association and where Varenna’s much valued and enduring friendships began with Trisha Rickards and Nigella Hall and Jane’s working student at the time, Darrell Scaife. Sir Mark Todd followed on from Jane and rode her in ‘98 and ‘99 with the highlight being a win in the OI at Ston Easton in March ’99 with a rare double clear before Darrell Scaife took over after Toddy went home in 2000. Ever the optimist Varenna decided that the mare would breed her some nice horses so she went back to Catherston again and and that heralded the arrival of Bruvver and Smart Reply into the event world. Bruvver came of age just as Toddy returned to the Northern Hemisphere but despite Mark’s legendary talent Bruvver never was over careful and when Mark moved yards he left Bruvver behind for Giovanni Ugolotti to compete. So began a long and fun friendship with Giovanni and his wife, Kathryn and no one could have tried harder with Bruvver but I think the term “downright careless” is an understatement where this horse was concerned! He finished his career happily showing the ropes at BE 100 and I cant think of any other owner who would have continued to go and watch him! Bruvver has actually achieved a sort of immortality however as he was a good looking horse and when Cam Price was launching Keyflow Feeds with Sir Mark he selected a photo of Mark out hacking on Bruvver for the Stay Cool feed bags. Varenna was delighted but Mark was slightly mortified to see that it was Bruvver who had made the cut over his more talented horses! Half sister Smart Reply also failed to impress despite her talented riders and over three seasons with Tim Price, James Avery and Giovanni Ugilotti she amassed a grand total of a whopping 2 points. “Smartie” was, if anything, more lacking in ambition than Bruvver, who at least got out of novice! More successful days came when Varenna became a share owner of Oplitas who Giovanni rode to CCI 3 star level. He was a full brother to Andrew Nicholson’s Armada and Nereo but unlike them he had an ability to add the occasional 20 to his cross country score. A taste of an international win came with a lovely horse called Not Kidding which Darrell Scaife rode to victory in Belgium and a beautiful bay horse, Haddon Trump Card, was eventing with Tim and having competed at three star level in 2014 was looking good for the future when his career was cut short by an injury. Varenna’s association with Tim continued when she became the main shareholder in Ringwood Sky Boy in 2015. “Ozzie” was a bit of a wild child and coupled with a habit of bolting as a youngster and not having much confidence in the showjumping Tim had been unable to sell him ever since he had purchased him very cheaply from some very relieved punters who had been horrified when they got their Gorsebridge Sales purchase home to discover he was basically unrideable! By 2015 though Ozzie was turning the corner and Tim felt confident enough in him to offer Varenna a share. He had completed his first 4 star at the end of 2014 in Pau and was heading to Badminton and Burghley. Finally Varenna had a 4 star horse and she loves Ozzie to bits. Not withstanding the fun at the UK 4 stars Ozzie also became Varenna’s first Olympic horse and she enjoyed a spin across the pond with him to Kentucky as well. The halcyon days have been reserved for Burghley though where Varenna has watched them finish 2nd, 4th, 5th and then finally to win it. Ozzie is by Courage and I can think of nothing more fitting to describe Varenna. 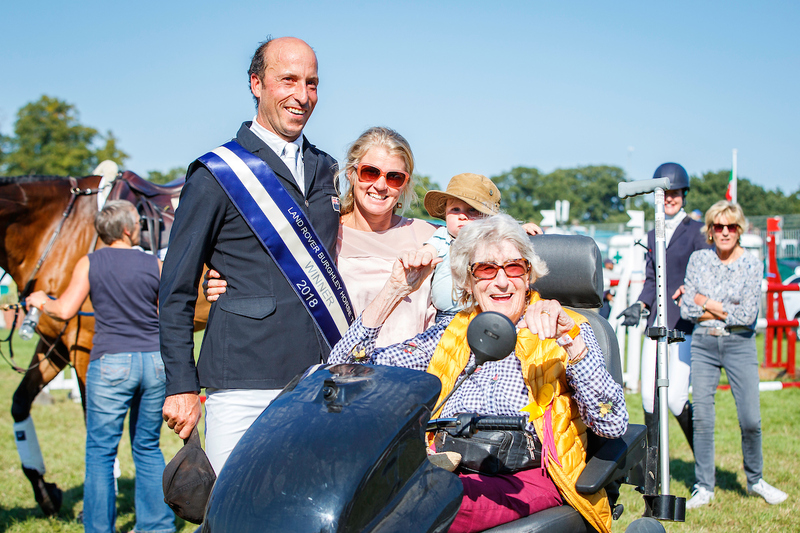 In 2015 she suffered a major stroke just before Badminton but despite being incarcerated in the Old Berks hospital insisted that Sophie and Caroline borrowed a wheel chair and “liberated her” so she could watch Ozzie’s dressage in person! She has impressed all of us with her wit, kindness, determination and her unspeakably brave attitude to what she describes as her “failing body”. Varenna is a whizz on her mobility scooter and is quite terrifying to watch off road but I can honestly say that as pleased as we all were at Burghley for Tim it was for Varenna that we raised the biggest cheer. She describes her journey with Tim as “miraculous” but in reality it is Varenna who is the inspiration.